FRONT ROYAL, VA — Every New Year the usual suspects on the Left generously offer their advice on how to preserve and protect the Republican Party. This time around, two of the liberal media's anointed "conservatives," Peter Wehner and Michael Gerson, take their turn. In several recent offerings, these co-authors attack the Tea Party and insist that, to "save the Republican Party," rational folks like them must embrace Big Government Conservatism — or the GOP will fail. But didn't the Tea Party save the GOP in 2010? Ah. Be not deceived: as a preamble to their prescription, we are required to acknowledge their view that the Tea Party's victories in 2010 were an "aberration." Because Gerson-Wehner consider the Tea Party to be an aberration. Its "anti-government fervor," they write, is "intensely felt." Gee. Is that a compliment? Gerson and Wehner are featured favorites of the liberal media precisely because they represent the "Republicanism of Losers" – the "Me Too!" tradition that goes back all the way to Wendell Willkie and Tom Dewey, and runs right up through John McCain and Mitt Romney — losers all. No. Notice how the movement's principles are reduced to emotions ("felt," "fervor"), while Gerson-Wehner claim the Olympian summit of intellectual virtue. Next, the Tea Party is "anti-government." This straw man comes right out of Obama's lexicon, conveniently diverting the public eye from the corruption, illegality, plundering, and other incipiently totalitarian realities of the Washington's bipartisan establishment. It is not government, but its corruption, which the Tea Party opposes. That's why the Tea Party supports constitutional candidates for – yes – government office. They intend to do exactly what the Founders expected the "virtuous people" to do: clean it up. Next, the neocon duo insists that constitutional conservatives fail "to articulate a vision of government," but then assert that the Tea Party's "fervor" is "justified by an apocalyptic narrative of American life." By turning moral language upside down, Dionne and Co. would have us believe that anyone who disagrees with their ideology is not only unjust, but craven, selfish, and un-Christian. The "apocalyptic narrative of American life" is visionary indeed — and it inspires not the Tea Party, but Pastor John Hagee's "Christians United For Israel," who very fervently supported George W. Bush. They advocated ever-wider American wars in the Middle East because, for purportedly biblical reasons, they wanted Armageddon to happen in their lifetimes. They wanted Bush to help, so they helped him. In fact, millions of Dispensationalist Evangelicals were indispensable to George W. Bush's reelection victory in 2004. Constitutional conservatives, on the other hand, were not. In fact, conservatives rejected Bush's war fervor (which nostalgia buffs can watch live on YouTube). And conservatives actually turned against Bush's Big Government debacles in the elections of 2006 and 2008. Which brings us to another curiosity: Wehner and Gerson insist that "intellectual honesty is the first requirement of self-renewal." Well, gentlemen, let's be honest, then. Both of these distinguished authors held important and influential positions in the George W. Bush Administration. Yet, in well over ten thousand words written to save the GOP from the Tea Party, these two scions of the Bush legacy never mention President George W. Bush! Perhaps that was unavoidable. After all, in offering to "Save the Republican Party," they tout the same "Big Government Conservatism" that destroyed the GOP under their old boss. Alas, with characteristic neocon amnesia, they've consigned poor "W" to the Memory Hole. So what's the honest truth? Frankly, the Tea Party has already saved the GOP — from George W. Bush! Gerson and Wehner, steeped in denial, apparently long to put the party back in the permanent minority — but firmly under Establishment control. And yet, there's a lesson here: Gerson and Wehner are featured favorites of the liberal media precisely because they represent the "Republicanism of Losers" — the "Me Too!" tradition that goes back all the way to Wendell Willkie and Tom Dewey, and runs right up through John McCain and Mitt Romney — losers all. That's why Washington loves them. Ironically, it's a wily leftist who comes along to blow their cover. E.J. Dionne graciously announces that Gerson and Wehner are wasting their time. When it comes to party differences, he writes, there really aren't any: we all agree already! And when it comes to Gerson-Wehner, he's right. Dionne's farcical "hidden consensus" aside, his hidden agenda plainly encourages envy, resentment, and, ultimately, hatred of those hard-hearted Tea Party taxpayers who would callously allow women and children "who had done nothing wrong to suffer." "Why," Dionne teases, "are we arguing about issues that were settled decades ago? Why, for example, is it so hard to extend unemployment insurance at a time when the jobless rate nationally is still at 7 percent, and higher than that in 21 states?" "Don't criticize," he implies. "You're one of us!" The florid prose of Gerson-Wehner cracks at the edges as the stiletto draws near: "It was not some socialist," Dionne smirks, "but a president named George W. Bush who declared: 'These Americans rely on their unemployment benefits to pay for the mortgage or rent, food, and other critical bills. They need our assistance in these difficult times, and we cannot let them down.'" Gerson and Wehner might want to forget Bush, but Dionne won't let them. He borrows their own Big Government argument and rubs it in their face. Well, who could possibly oppose the Bush-Obama consensus then, Dionne asks? "A substantial section of the conservative movement is now determined to blow up the national consensus that has prevailed since the Progressive and New Deal eras." And who is the common enemy of that consensus of the Left and the "Big Government Conservative" neocon "Right"? And how inhuman they are! "This bipartisan understanding meant that conservatives such as Bush fully accepted that it was shameful to allow fellow citizens who had done nothing wrong to suffer because they had been temporarily overwhelmed by economic forces beyond their control." So Gerson, Wehner, and Dionne agree: the Tea Party is indeed a "shameful aberration," because it rejects what Dionne has generously revealed to us: a "hidden consensus" on "core questions involving social justice" that unites all thoughtful people. Dionne hijacks "social justice" – a legitimate principle of Catholic social teaching – perverts it, and then slaps it gaily on his vision of the welfare state. Where it becomes a deadly sin. "Envy used to be just a human failing," writes economist Thomas Sowell, "but today it is a major industry. Politicians, journalists and academics are all part of that industry, which some call "social justice." After all, it would be "shameful" not to embrace their left-wing agenda – right? And thus, the anointed among us have every reason to condemn the backward, taxpaying naysayers. This irresponsible bombast stokes not only envy, but its dangerous companion, resentment. "There are nearly unlimited opportunities to pander to people's sense of injustice, victimhood and entitlement," Sowell writes. It's part and parcel of "the politics of our time – the politics of envy and resentment." Madame DeFarge, call your office. And bring your knitting. Both Dionne and Gerson-Wehner are united in their desire to distract and dissemble. Dionne is as desperate to distract us from the disasters of Obama as Gerson and Wehner are in disowning those of George W. Bush. This is their common cause. There is an elephant in the room, as well as a donkey. Nothing happening here, folks — move along. All three of these characters write for the Washington media establishment — which pays well, but can exact a high cost in character. Their common purpose is clear: to foment scorn, condescension, and contempt for taxpayers outside the Beltway who have had enough of "Republicans" like Gerson and Wehner and Democrats like Dionne and the bipartisan corruptos they shill for. Which goes to show that, when the chips are down, the bipartisan liberal establishment will forget its partisan "differences" in the name of that "hidden consensus," and unite to defend itself against the efforts of people from the rest of the country who want to unplug the Beltway Hot Tub. So much for "intellectual honesty." 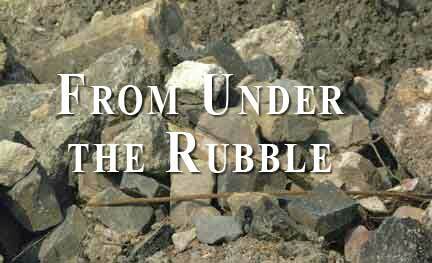 From Under the Rubble is copyright © 2014 by Christopher Manion. All rights reserved.